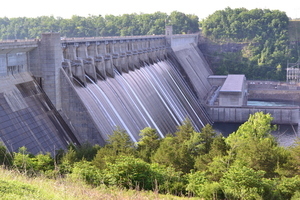 If you aren't familiar with the White River system, you might not know that both the Norfork and White Rivers have dams that were built to produce hydroelectric power. Build in the 1950s, the dams dictated where, when, and how we fish our waters. Water levels in the rivers (and lakes) can fluctuate daily and can be tricky if you're unfamiliar with how things work. Usually when water is getting ready to be turned on at either of the dams, a siren will warn those nearby. If you're far enough down the river you might not hear the sirens and will have to take extra precautions if you're wading. Always pay attention to the water levels on a stable object (such as a large tree or the launch ramp) to make sure the water isn't rising. We recommend using the buddy system when fishing because what may be a peaceful day can turn into a tragedy. From time to time, there will be someone stuck on an island waiting for the water to recede, or even worse - someone might be drifted away. When you fish with Two Rivers, you can have peace of mind because we are familiar with what to watch out for and can usually tell you when the water levels are expected to change.